HTC has floundered on the smartphone front of late, but if a new leak is to be believed it could soon right the ship, and with more than a few nods to its competitors. Images of a device codenamed Ocean Note have landed courtesy of Weibo, showing an HTC-branded handset at various angles and in different colors. Though it's hard to tell the phone's size from the photos, the 'Note' name indicates it tips the scales towards phablet. The most striking revelation of the latest HTC Ocean Note leak is what appears to be a second-screen display, an addition we've seen flexed in the LG V10 and LG V20. In LG's devices, the sliver of an always-on upper deck display provides information like the time, weather and notifications, as well as shortcuts to favorite apps. The same details and shortcuts are present in the Ocean Note's second screen. And just like LG's second screen, the line of icons here are oriented to the right, leaving room for the phone's front-facing camera lens. Looking elsewhere, the HTC Ocean Note design gives off a Galaxy S7 vibe, but as Android Police points out, there's a prominent camera hump, a feature Samsung shaved down in recent phones. The HTC handset also looks to have an all-glass frame, which makes for a shimmery effect, similar to the Honor 8. 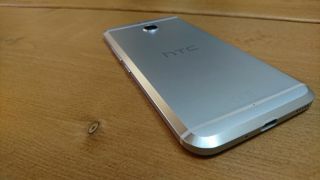 HTC is known for tapping aluminum for its phone frames, such as the all-metal HTC 10, so going glass would be a radical change for one of its handsets. Finally, the leaks show the absence of a headphone jack, a port HTC did away with in the HTC Bolt and a missing feature that lines up with previous rumors. Though these images should be taken with a grain of salt, the Ocean Note has some promising qualities, especially the sleek all-glass frame. And while a second screen may at first glance seem like a gimmick, LG's dual screens eventually won us over with their usefulness. The same could happen with the Ocean Note, especially if it runs Android Nougat (highly likely) and taps the OS's multi-window feature. The photos are dated January 5 and were snapped in Las Vegas, according to Android Police, so HTC was likely pulling out the Ocean Note during last week's CES 2017 show. HTC has an event happening on January 12, at which it's expected to unveil three phones: the HTC U Play, HTC One X10 and HTC U Ultra (Ocean Note). Will these devices swim to the top, or get lost in the sea of other handsets? We should find out very soon.